The quiet village of Fairport Harbor is located along Lake Erie at the mouth of the Grand River in Lake County, OH. There are many attractions for boating enthusiasts to enjoy while docking at the courtesy floating docks at the Lake Metroparks Fairport Harbor Lakefront Park including swimming, kayaking, light house museum tours or take a journey to the past by visiting Tall Ships of Fairport Harbor. Fairport Harbor Port Authority has chosen Metal Craft aluminum truss floating docks as the preferred dock for both the courtesy launch ramps and courtesy docks. 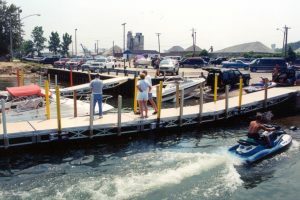 The floating launch ramps were installed over 16 years ago and still look as good today as the day they were installed despite the heavy traffic in the summer months. The courtesy marina dock system across the harbor features large 6′ wide by 20′ long ramps and dock slips measuring 4’w by 15′ and 20′ long. An ADA aluminum gangways allow for easy access to the courtesy docks from shore. All Metal Craft floating docks feature polyethylene floatation so they are environmentally safe – a requirement by the ODNR. Our superior aluminum decking with non-skid, baked poly acrylic finish in Earth Sand for the surface layer, protecting boaters from slipping as they enter and exit their watercraft. Metal Craft Docks require little maintenance and will last decades into the future. Consider contacting Metal Craft Docks for a dealer near you, if you are interested in having a quality product for your lake front property. Metal Craft Docks is a family owned and operated business priding ourselves on exceptional quality, design and outstanding customer service. We have been manufacturing docks for over 80 years! Metal Craft Docks and Lifts are naturally light-weight making installation and removal for storage easier. We are proud of the craftsmanship that goes into every one of our products manufactured locally in our Painesville, Ohio facility. When you purchase a Metal Craft Dock and Lift you are making an investment. We know you will be happy with your Metal Craft purchase for decades to come!